Don’t Let Your Cleaning Cards Dry Out! The next thing we usually ask is: HOW did you clean your scanner? Many users are aware that they need to do it as a regular part of their daily, weekly or monthly routine, as the case may be. But if not done properly or waiting too long, a typical cleaning may not do much good – or, in some cases, even leave you worse off. One of the most common mistakes in cleaning is to open the cleaning card package first and leave it sitting out on the counter while they set up the actual cleaning process. 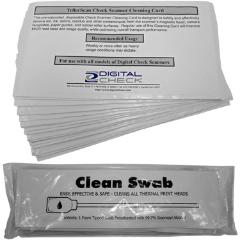 Our cleaning cards are saturated with alcohol, and have a useful lifetime of approximately two minutes before enough evaporates to diminish their effectiveness. (There is nothing that can be done about this – other materials that would retain the alcohol for longer would not do a good job cleaning the rollers and camera lens.) Since the cleaning process takes 60-90 seconds, it is imperative that you get everything ready to go first, and only open the card just before you start. Another frequent misstep that can cause ineffective cleaning is to use your regular scanning software to pass the cleaning card through the track. This can cause the software to misinterpret the cleaning card as a misread or a jammed document, wasting enough time that the card begins to dry out halfway through the recommended several passes. Digital Check scanners can launch a window which has a “Clean” button that will run the motors without being connected to any software; we recommend either launching this window and using that button, or alternatively, you may exit your program and open our ScanLite2 diagnostic program to run the card without capturing any images. ScanLite2 is also the perfect test program that you or your helpdesk can use to quickly determine whether the scanner is functioning properly. What happens when a cleaning card starts to dry out? In the best case, it removes less dirt than it normally would have, and you’ll need to perform cleanings more frequently. If the card dries out completely, fibers will actually start to flake off in the rollers – leaving your scanner dirtier than it would have been if you did nothing. Using the same card to clean more than one scanner. Many users also blow the track out with compressed air instead of using a cleaning card, which is recommended in addition to the regular cleaning process. However, if used alone, compressed air removes dust but not adhered dirt, and does not clean the camera lens. If dark streaks are noticed on the images, simply opening the outer camera door allows easy access to wipe off the glass. As a final reminder, knowing how many documents you are scanning every day will help you stay on top of regular maintenance. Elapsed time does not have much to do with how often a scanner needs to be cleaned; we recommend doing so about every 5,000-8,000 items. For a single-feed scanner in light use, this may mean only one or two cleanings a year. For a machine at a teller window, it may be once every two weeks; for a machine doing batch capture for an entire office, it may be every day or two. So do yourself a favor this winter: Figure out how often you should be cleaning your scanner, set a schedule, and make sure you’re familiar with how to do it. It takes 2 minutes and a $1 card, but it can save you hours in the long run.